PCs that run on processors that are of the Skylake or later series are reportedly displaying obstructive messages in the course of their update to the October version of Windows 10. This is due to an older Intel Display Audio driver that may cause instability if still present when the machine has finished upgrading itself. Users with PCs containing Intel chipsets of the sixth or subsequent generations may be advized to check all their drivers if they want to upgrade to the newest version of Windows. 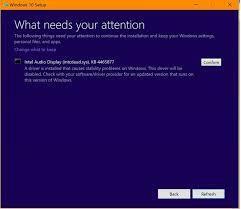 This update (Windows 10 October 2018, or version 1809) apparently has issues with the Display Audio drivers associated with these chipsets. Currently, machines with this silicon are getting a 'What needs your attention' message during the update that turns them back to their existing Windows version. This only occurs if the offending driver is of a version older than 10.25.0.10. Intel claims that this can be addressed through downloading an updated driver with this number prior to attempting the major Windows upgrade. Therefore, simply downloading the Intel Graphics Driver update as a whole should also solve the problem, provided that this upgrade is the 24.20.100.6286 version, at least. However, users are also advized to check with the manufacturer of their PC for any other compatibility issues with the new Windows version before installing it.